The Lovecraftsman: An unholy melding of Superman and Cthulhu begets: Super Cthulhu! 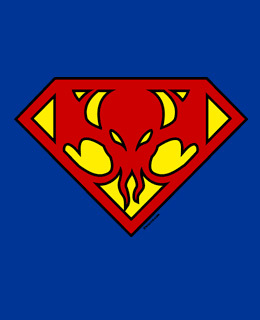 An unholy melding of Superman and Cthulhu begets: Super Cthulhu! It’s a bird! It’s a plane! It’s a monster of vaguely anthropoid outline, but with an octopus-like head whose face is a mass of feelers, a scaly, rubbery-looking body, prodigious claws on hind and fore feet, and long, narrow wings behind! I admit it, I only blogged this image so I could type that. I hope it amused you. Second, we could not open the trunk cover of the mechanical replica cartier. It must be done by the professional repairing staff. Even an advanced insolent table meters, you should not open the trunk cover with uncommon practices for your moment adventures. The trunk cover of many mechanical replica cartier is transparent and we can clearly see its working. The only undesirable places for many of the mechanical cartier replic sale are the maintenance problems. If there is the problem for the mechanical watch such as the Emporio Armani cartier replic sale, it would be the very complicated issues for the watch itself. So we need to pay more awareness of the routine maintenance for the mechanical hublot replica uk. replica watches the ambit by consistently afterlight thier designs and silhouettes while application the breeding that defines their style. Many of leather accoutrements are still hand-stiched and use the acclaimed GG bolt which we accept all appear to http://www.garaventa.co.uk know and love. Despite their acclaimed history which includes abundant ups and downs, Gucci still remains chichi and able-bodied put calm as ever. It's so cool!! Thank you for sharing the post!